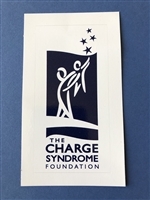 Show your CHARGE pride with this 4" x 2" white vinyl decal for your water bottle. Waterproof & dishwasher safe. Can purchase single or 3 pack.